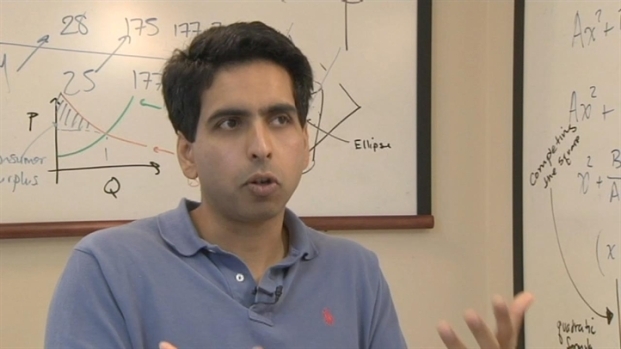 Read Raj Mathai's full interview with Khan Academy founder Sal Khan. His book, "The One World School House," comes out next week. Raj: "Has it snowballed or is it just slow snowball, the success and the exposure?" Sal “Back when it was just me operating in a closet in 2006, it was already beginning to snowball, you know the user traffic was growing 30 percent a month but it was going from 10 to 13 people, but you keep doing that and it goes from 10,000 to 13,000 or 100,000 to 130,000 now it’s at millions, but yeah it’s been crazy." Raj “Aside from the education part of it, aside from the politics, the praise, the controversy, whatever, are you surprised at the success that you’re having." Sal “Yes, I’m definitely surprised at the speed at which all this has happened. I think when a lot of people anyone when you’re working on a project, it takes awhile for traction to happen, even for me, when I was in my closet, I was like a lot of people seem to be getting value from this but the world hasn't’t really noticed, and then all of a sudden, it happened, and once it started to happen, it started to happen really really fast . We’ve been shocked at just the number of users worldwide using it, the number of teachers worldwide that are using it, kind of our ability to at least be part of the conversation of even what a classroom should be." Raj: “What did you want to be when you grew up as a kid?" Sal: “When I was a kid depending at what stage a kid I was, I wanted to be an animator at one point, an architect, and them um, and then later and I think for all students whenever you get a lot of positive feed back, I started thinking of maybe an engineer or physicist, and then computer science came into existence. I was always fascinated with making things." Raj: "Bill Gates I love this story in the book, the first meeting with Bill how was it? Describe it." Raj “After you met with him, what was that first phone call or the email or the text to say hey thumbs up we’re going to give you millions of dollars?" Raj “You’re a non-profit, you could make a lot of money doing what you do, knowing what you know. Why not make it a for profit, like so many people around you in the Silicon Valley make a bunch of money?" 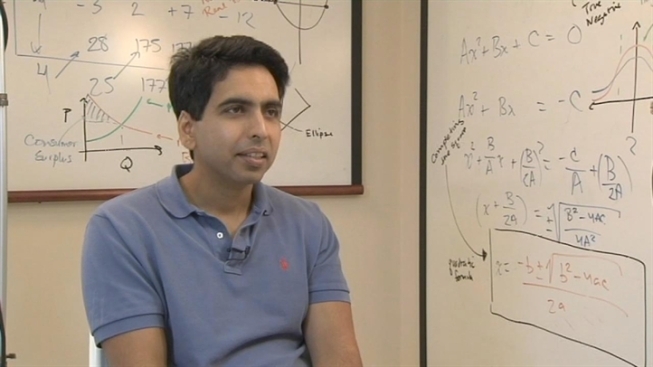 Sal Khan talks about meeting Bill Gates. Raj: “Do you consider yourself as someone who is revolutionizing education in a modern way?" Sal: “I try and stay away from any hyperbole. I mean you see from well basically from looking at me, and where we are, that things are still in their humble beginnings. I’m excited about the potential. Raj "But you are changing things you do know that?" Sal: "Yeah, I’m excited. The conversation has changed and I don’t know if we’re kind of growing at the right time, and kind of capturing people’s imagination, or maybe we are the catalyst. I don’t know the answer to that but the reality is there is a change in the conversation as to what is the role of technology, how can it be used to supercharge classrooms, should teachers be giving lectures anymore? Can we move to a model where students move at their own pace as opposed to you know one piece fits all? In that way hopefully we’ve already moved the dial, but I don’t think we’re no where near our potential. I stay up at night fearing that in two, three, four years, oh that Khan Academy thing was a good idea. Whatever happened, I don’t want that and I hope in 10 years we’re doing another interview and we look back at 2012 and we say oh that was just the beginning. Raj: “Are you surprised by the controversy that you’ve elicited in terms of you’re changing the way education is in a dangerous direction?" Raj: "You said you don’t really know what you’re going to say before a video. If you need to refresh you’ll Google for a couple of minutes. You said that but I think you insulted a lot of teachers by saying that. Do you regret it?" Sal: “I think I’m learning things can be interpreted in multiple ways. When I say I don’t script videos, when I say yeah, I’ve used Wikipedia, I’m not saying I look at Wikipedia for two seconds and then make a video. What I’m saying is yeah, that’s my starting point, and when I say I don’t script videos, I’m saying I think deeply about what I want to do, so I am prepared in that sense, but I don’t read a script. A lot of the great teachers I talk to say that’s their methodology too. They don’t read their lecture notes. They internalize the information, so it gives them more of a chance to be real time, but by no means is there the intent to offend anybody, or to make anything look easy or anything like that. The other thing I want to emphasize is I don’t view myself, I mean people can call me anything they want, whether it’s a virtual tutor or a web teacher or anything, but people should not equate me with the in the trenches kind of work real teachers have to do. You know it’s very easy for me to sit and record a lesson. I do prepare a lot for them, and I do a lot of research, but I still don’t have to you know. That’s only a small fraction of the work a teacher has to do. A teacher has to deal with the human element. What’s going on in the student’s mind? What’s going on in their life? How do we connect them? What I’m hoping the tools at Khan Academy to do is taking that one piece you know here’s a small explanation, here’s some exercises you can do, it frees the teacher to focus on the higher value things." Raj "Are you learning now though that whatever you say because you’re such a high profile person is that whatever you do say teachers are listening and even little soundbites can be taken in the wrong way?" Raj : “At some point, do you need to have a virtual town hall with teachers? And just say hey this is what I’m all about because there’s probably a lot of misunderstanding out there." Raj: “Your dream scenario, let’s talk locally here even though you act globally abut your dream scenario for a local situation is about a kid in a certain school district, tell me about it. The kid who isn’t getting the proper instruction and how can he get it?" Sal: “Any student here in the Bay Area has a free tutor. It’s Khan Academy, and they have exercises and get feedback, and they can use it tomorrow. That’s a minimum case. The next layer is ok, you’re in a classroom, um how do we make that classroom more interactive, and that’s where we’re seeing a lot of these pilots, all over the Bay Area where they’re saying let’s take a lecture out of class time, let’s do more interactive things, so it can be one-on-one time with the teacher, it can be peers teaching each other, and the next level I think that’s getting closer to your question, the dream is I imagine in the Bay Area and hopefully the rest of the world, schools of all sorts, public, private, charter, where students are allowed to work at their own pace, master concepts, before moving on. There’s no use having a C understanding of algebra, a C understanding of geometry, and the best you can do with calculus is get a D. We want you to get a very high level of mastery throughout. It will be all at your own pace, and then really pushing the envelope at what a classroom can be. There’s a school, Summit Prep, here in San Jose that is starting to experiment with some of these things, saying hey let’s break down these walls between classrooms, let’s have teachers teaching together, and let’s make it all interactive." Raj: “Ok, nuts and bolts, obviously your time is getting pulled in a lot of directions, and ways. How often are you in this office doing your videos?" Sal: “Depending on the week, but most days I’m here for essentially the entire morning, I’m here from 3 to 5 hours days making stuff." Raj "Garggle, tea, exercises, how do you keep your voice going?" Sal: "You know I used to do more of that but now I don’t. I just come in, hot water. A lot of hot water." Raj: "Will you ever make an on-camera appearance?" Sal: “I’ve inadvertently made where we have these medal videos and stuff like that, but yeah most of the time I’m not there, and that’s good because I think my unibrow might be distracting. The form factor we use is you hear the voice and you see the writing, and that’s really good for a lot of the stuff we have right now, but there is a need I think for academic interviews. Let’s understand a neutron better, and maybe a face could be interesting there. I think there could be interesting things where we visit someplace but even there, even if I inadvertently show up, it’s all about focusing on the content. You might see faces, but our core idea is always be 100% focused on the content." Raj: "You’re a kid at heart." Sal: “I am a kid at heart, yes." Raj: “You brought up it up. Where will we be in 10 years? I won’t be interviewing you, but where will you be?" Raj: "So you still love just doing the videos?" Sal: “Oh yeah when I’m 60 years old, 70 years old, whenever, there’s a far more competent person than me that is doing, running the operations of Khan Academy, and there will be a whole team of people who are also making content, but I can just sort of sit on a hill someplace and make videos on quantum physics." Raj: “The most interesting or one of the most interesting calls you’ve received from some high profile people, out of the blue?" Raj: "White house reach out to you?" Raj: "Final question for our Bollywood fans. Who’s the most famous Salman Khan in the world?" Sal: “The most famous Salman Khan um is not me." Raj: Just like him you reach a lot of people. Sal: “I reach a lot of people. So ok, I take it back, amongst non south Asians, I might be edging him out. Amongst south Asians, as long as he's still playing 18 year olds who’s helplessly in love, as long as he’s in those roles, yes I think he’s got a leg up on me."